Don't Run from the Cops! RUN WITH THE COPS! Join Police Chief Andrew Smith and department personnel this Thursday, May 3rd, for the first ever "Run with the Cops." 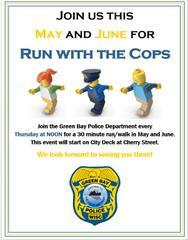 Every Thursday, until June 28th, officers will meet on the city deck at 12:00 PM to run or walk for 30 minutes. The run/walk will start on the city neck near Cherry St. The run/walk will follow the city deck along the beautiful Fox River Trail. We will run/walk for 15 mins in one direction and turn back so we end in the same place we started. "We started this run/walk to promote healthy habits for department staff, as well for members in our community," said Police Chief Andrew Smith. "We hope residents join us, as it's not every day your running with the cops, we tend to see the opposite," says Smith. Please join us as we kick off the summer months and enjoy the great downtown atmosphere.